In BICC's recent Policy Brief “Towards conflict-sensitive employment in large-scale infrastructure projects in fragile and conflict-affected settings”, Elke Grawert outlines recommendations for donor agencies. 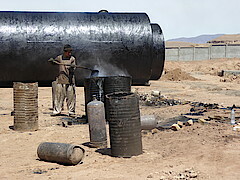 In fragile and conflict-affected settings (FCAS), large-scale infrastructure projects often connect areas under various forms of rule. Donor agencies and development banks should demand from contractors conducting feasibility studies to include conflict-sensitive employment (CSE) strategies for those parts of the infrastructure project that are affected by violent conflict. In addition to available international procurement guidelines, donor agencies and development banks should require bidders to outline a CSE strategy. They should demand from bidders a convincing calculation of the costs of CSE, especially in comparison to the costs of anticipated security measures for the duration of the project, its maintenance and protection for a specified period (at least five years) after completion. The CSE framework (Grawert et al., 2017) should be attached to the tender as a guideline. As changes in control over areas and settings of armed conflict are common in FCAS, conditions for company operations in large-scale infrastructure building will change, too. While bidders' contingency plans should include such potential changes, donor agencies or development banks should allow for budget adjustments if these changes exceed the anticipated volume of the project. Local companies often are familiar with local power relations and able to assess project risks in local areas realistically. Donor agencies and development banks should require from bidders an initial outline of units that will have to be constructed by local companies, and bidders should detail the envisaged CSE strategies. Donor-funded skills upgrading measures could enable local companies to carry out part of the operations required for the large-scale infrastructure project. Such projects will thus become development corridors that enhance mobility and communication as well as professional qualification of the local inhabitants.